* This post initially appear on the Practicum: Critical Theory, Religion Pedagogy blog. We are pleased to share this pedagogical piece here on the Bulletin‘s blog and we encourage readers to check out other valuable posts on the Practicum blog. When I was twelve, I went on my first trip to Europe. While touring Europe may not seem as exotic as say trekking around the Egyptian pyramids on camelback, for me, a young girl from a lapsed Catholic family living in North (and very Protestant) Florida, it was like being on another planet. Ya’ll was part of my natural parlance, tea was meant to be served cold with ice, and perhaps most jarring to me were the perplexing images I saw in Madrid Spain during holy week. It was almost 2:00 AM and I was still wide awake. The noise and lights outside of my hotel room in Madrid made sleep impossible. Below, on the street, hundreds of people swarmed, watching a procession of giant statues (weighing thousands of pounds) which depicted the Stations of the Cross (basically it was a series of statues depicting the torture and agonizing death of Jesus) as they lowly made their belabored way down the avenue. These statues were gory and unnerving to view. Even though I was raised a Catholic, Catholicism in the Protestant saturated south has shed much of the outward ‘Popish’ and ritual ornamentation. Here was ‘real’ unapologetic Catholicism in full swing. The processions themselves were not as shocking to me as the mass of humans walking around (all week) in hooded robes of many colors and fashions. These robed and hooded figures loomed ominously in the streets. Unbeknownst to me at the time, these conical hoods are known as capirotes and are worn by penitent Catholics participating in the numerous processions happening throughout Holy Week all over Spain. 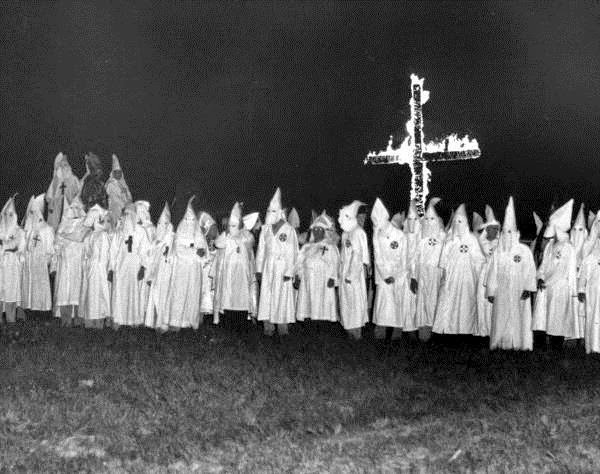 Being very young and from the southern United states (still rife with racial tensions), my only context for hooded figures was the Ku Klux Klan. Needless to say, I was terrified. Compare the two images (one of hooded penitents in Spain and the other of KKK members burning a cross). The hooded figures look very similar and yet what they represent is radically different. 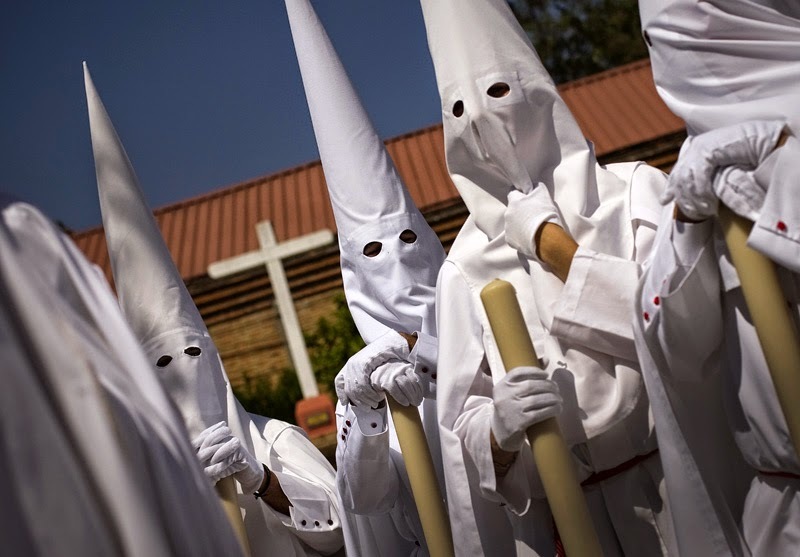 While there may be no inherent ontological meaning in the very robes and coned shaped hoods worn by either the penitents or clansmen, the (white) hooded figure has become a symbol within these different contexts. Being ignorant of the vastness of contexts in which symbols or signs can be read, can lead us to interpret a cultural sign or symbol… not necessarily wrongly but rather inaccurately for that particular context. This experience although kind of embarrassing is one of the many I share with my students to demonstrate for them that symbols and signs are not universally readable nor are they historically stable. This entry was posted in Kate Daley-Bailey, Pedagogy, Religion and Society, Religion and Theory, Theory and Method, Theory in the Real World and tagged american religion, capirotes, Christianity, KKK, Klu Klux Klan, pedagogy, Practicum: Critical Theory, Religion, religious studies, Spain, symbols, teaching. Bookmark the permalink.